Wall Street has yet to flinch at the turmoil in Washington that threatens to unravel the agenda at the heart of the Trump rally. 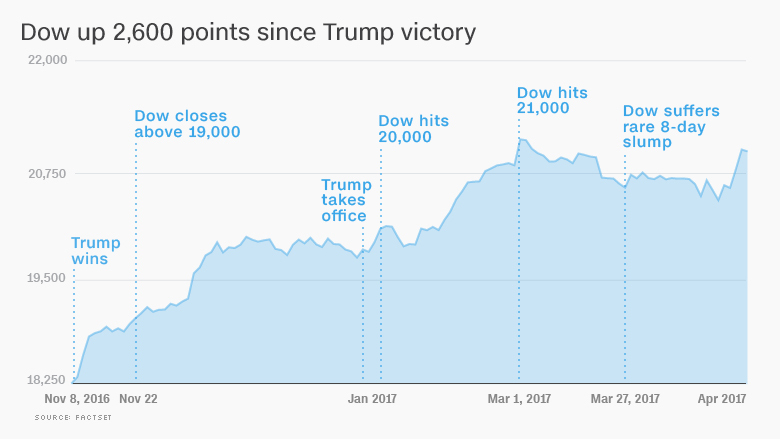 The S&P 500 and Nasdaq both climbed to fresh record highs on Tuesday despite the latest controversy over reports that President Trump shared classified information with Russia's foreign minister. Even though Trump's stumbles threaten to further delay the tax cuts investors are craving, CNNMoney's Fear & Greed Index is firmly in greed mode. Caution seems to have disappeared as evidenced by the VIX volatility index, which is at 23-year lows. 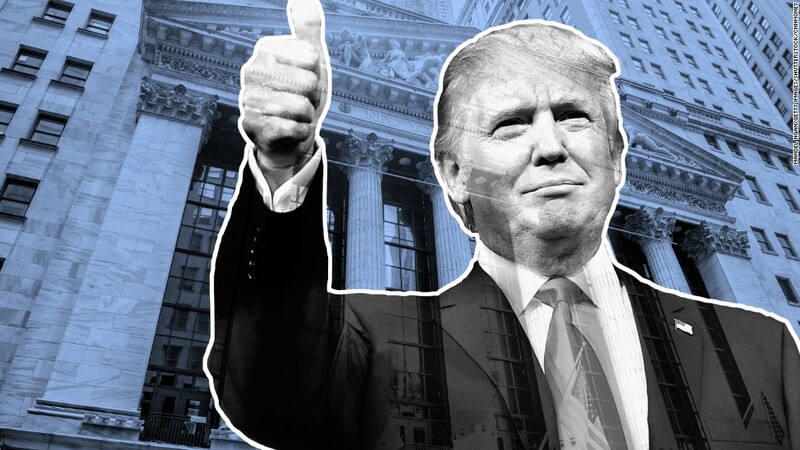 After all, stocks soared because of hopes over President Trump's promises of tax reform and deregulation. So, why aren't markets freaking out now that the administration is being bogged down by controversy, such as the firing of FBI Director James Comey. The mystery can be explained by the fact that corporate profits -- a cornerstone for stock prices -- have enjoyed a renaissance this year following a prolonged "earnings recession." Profits from S&P 500 companies surged by 14.9% during the first quarter, the fastest rate since 2011, according to CFRA Research. That's a far cry from the painful decline of nearly 7% experienced at the start of 2015, back when stock prices were doing little. "The earnings backdrop has been the offset to the less-than-stellar performance out of Washington," said Joe Quinlan, chief market strategist at US Trust. Not only are corporate profits growing again, but CEOs are releasing numbers that are better than what Wall Street had been anticipating. Roughly three-quarters of the 450 or so S&P 500 companies that have reported results this season have beaten profit expectations, the highest rate since 2010, according to Ryan Detrick of LPL Financial. "It's safe to say the market has successfully emerged from the earnings recession," Lindsey Bell, an investment strategist at CFRA Research, wrote in a recent report. All of this is very important because the Trump rally carried stocks so high that many feared they had gotten ahead of reality. Over 80% of fund managers surveyed by Bank of America Merrill Lynch in April said US stocks are the most "overvalued" region in the world. But the healthy earnings season has eased valuation concerns. Even though stocks are at record highs, closely-watched barometers for market valuation have cooled off. For instance, the S&P 500's price-to-earnings ratio of 17.5 remains well above the 10-year average of 14, but below the 13-year highs experienced earlier in the year. The earnings rebound has been led by the energy sector, which has finally stopped bleeding. That makes sense because while oil prices remain turbulent, they soared by more than 50% between early 2016 and early 2017. For instance, ExxonMobil (XOM) profits skyrocketed by 122% during the first quarter, ending a two-year slump. Of course, it's not only about energy. Even excluding energy, S&P 500 corporate profit growth would still be a very healthy 11% from last quarter, according to CFRA Research. Other sources of strength include tech, financials and materials -- all of which enjoyed stellar growth of 20% or more during the first quarter. Highlights included strong numbers from big names like Facebook (FB) and Morgan Stanley (MS). "The earnings speak to an economy that's accelerating and a consumer that has the confidence to spend," US Trust's Quinlan said. Companies with more of their business overseas are also doing well, a big shift from recent quarters when global turmoil and the strong US dollar caused problems. The question is whether Corporate America can continue growing its bottom line in the face of continued uncertainty about the fate of the Trump agenda. Some political observers worry that controversies like the one over sharing classified information with Russia will get in the way of Trump's ability to land the sweeping reform in Congress that Wall Street had been banking on. Trump defended himself on Tuesday, saying he had the right to share information with Russia on terrorism and other issues. "The GOP's legislative agenda is beginning to slip from its grasp," Isaac Boltantsky, a policy analyst at Compass Point Research & Trading, wrote in a report on Monday. Boltansky complained that the "volatility" of the Trump administration will complicate even the simplest legislative efforts, "let alone the herculean tasks of health care and tax reform." All of this puts the onus on corporate profits to continue supporting a market that could find out that the Trump agenda may be a letdown.